What is Bisphenol A or BPA? Is it used in PET bottles? Bisphenol A or BPA is an industrial chemical most commonly used in the production of polycarbonate plastics #7 (hard, clear plastics). 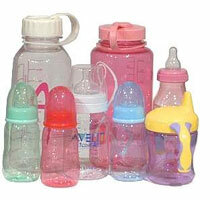 BPA has been used to manufacture plastic bottles and other types of plastic for over 50 years. It can be found in plastic food wrap, baby bottles, and epoxy resins (the lining in aluminum and metal cans). It has been said that BPA can leach from these materials and cause estrogenic hormone disruptions that can lead to reproductive damage, birth defects, and cancer in adults. Is BPA found in PET bottles? Most plastic water bottles are manufactured and packaged with Polyethylene Terephthalate (#1 PET or PETE). The use and reuse of these bottles has raised a few red flags among environmentalists. But do these types of bottles contain BPA? According to the National Association for PET Container Resources (NAPCOR), the potential for PET bottles to leach harmful contaminates is limited. "The bigger risk to consumers is probably bacterial contamination," says Rolf Halden, a drinking water expert and assistant professor at the Johns Hopkins Bloomberg School of Public Health. For people with healthy immune systems and reasonably good washing skills, however, even this risk of microbial contamination remains slight. 85% of water bottles are never reused. The EPA, in a document entitled "Bottled Water Basics," says: "Drinking water (both bottled and tap) can reasonably be expected to contain at least small amounts of some contaminants. The presence of contaminants does not necessarily indicate that the water poses a health risk."